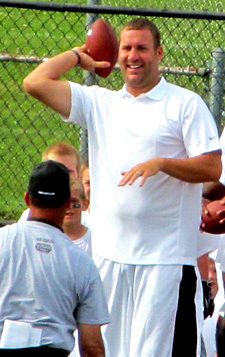 The two-day camp, organized by ProCamps Worldwide and sponsored by Giant Eagle and Fifth Third Bank, was the sixth annual Ben Roethlisberger football camp and the third hosted at Seneca Valley High School. The whistles of 50 local football coaches blared above the noise of the excited children, whose ages ranged from 7-14. The Raiders’ Stadium was chaotic as the campers, outfitted in their matching white t-shirts, ran between stations to learn different football skills. Roethlisberger roamed from group to group coaching them one-on-one, hopping on his blue Schwinn bicycle to ride between the two fields. The players, at one point, sat mesmerized as Steelers head Coach Mike Tomlin gave them a “life lessons” pep talk. But it wasn’t all work and no play — some campers danced to a DJ’s music, rolled around on the turf or made goofy faces for the news cameras. Roethlisberger did stop to have some fun of his own. He pranked campers by spraying them with a water bottle and hiding behind a group of coaches. When the campers caught sight of the quarterback they shouted, “Ben!” and dissolved into giggles. “I wish all the hosts would do that! Regardless, we love Patriots player camp each year!” — Patriots fan Samantha Downs, on Ben throwing a pass to each youngster. “Two of our foster children had the chance to attend Ben Roethlisberger Football Camp this week and some very special memories were made! We are grateful to all who made this extraordinary opportunity possible!” — Every Child, Inc.
We’ve added even more photos to our growing Camp album here. And congratulations to parent Stacey Clark, whose photo below was the winner of the Polaroid Fotobar “Winning Image” contest! You can see more of her photos in Ben’s Camp album! Ben stands with other players in the hopes of getting drafted on Day 1! Now, he was drafted, but apparently it wasn’t until late in the first round – understandable, considering he had a lot of talent around him!